This is one of those stories that teaches as well as tells a great story. Rose is a young girl getting ready to celebrate her seventh birthday in a refugee camp in Chad. The book shows how difficult life is for her. She and her mother must walk to a hot geyser to get their water for camp. Then they must carry the jugs of water back on their head. To get to school she and her friend walk a rocky trail to their outdoor school. They sit on small stools under a thatched roof. After school she and her friends go to the cave of dreams where they play music and dance. Later her family bring her a chocolate cake and a surprise. Her uncle and new cousin arrive. He has brought her a gift. The gift is a stuffed animal she had to leave behind. 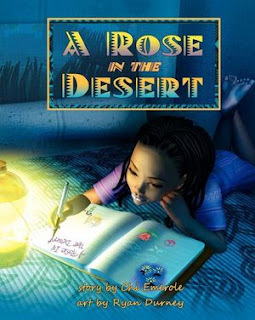 As she prepares for bed that night she is inspired to write a poem called, “A Rose in the Desert”. This is a wonderful book full of hope in the face of terrible odds. Chi Emerole is the last of six children, born to two Nigerian teachers in a small village she and her siblings fondly call "Ogele City". She came to the United States of America at the age of nineteen. She is a pediatrician and a member of the Society for Children's Book Writers and Illustrators. She currently lives in Atlanta, Georgia, with her husband and adorable son. She is passionate about poetry, creative writing, traveling, and improving the lives of children.